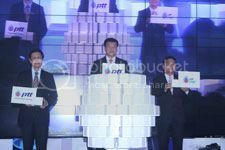 Thai firm PTT Polymer Marketing, a subsidiary of oil company PTT Public, has opened its fifth international representative office in Jakarta, Indonesia. According to a recent report by the McKinsey Global Institute, Indonesia could add 90 million new consumers by 2030 to become the world’s seventh largest economy. Currently, Indonesia market's economic and political stability has huge potential of growth especially as we move towards the ASEAN Economic Community or AEC in the near future. “To meet the customers' needs and to increase competitiveness and strengthen the petrochemical business for PTT Group, The PTT Polymer marketing Jakarta Representative Office will be the company’s regional distributor and technical support centre,” said PTTPM President Supachoke Liamkeao. As the major polymer sales and marketing company in Thailand and a polymer marketing arm for PTT Group, PTT Polymer Marketing has established representative offices in several strategic locations such as China ( Guangzhou and Shanghai), Vietnam (Ho Chi Minh City) and established Polymer Marketing DMCC in Dubai, United Arab Emirates. It also plans to set up offices in several countries in the near future. PTT Public is the national energy company of Thailand for oil and natural gas business, considered one of the largest integrated petrochemical producers in Asia.